Recently, there was a comment posted by Gary Goodenow in the Grave Thursday entry for General Dodd relating a story about a possible relative of Gen. Dodd’s who participated in the execution of King Charles I of England, and was later executed himself for treason by the restored King Charles II. Gary mentions that the colonel in question attempted to use the defense that he was following the command of his superior when he participated the Charles I’s trial and death. This defense did not succeed for Col. Axtell. However, the idea of a “following orders” defense reminded me of another legal case related to the Lincoln assassination. It was a case brought forward by a man named John McCall who lived in Mendocino County, California. Before getting to Mr. McCall, however, some background knowledge on a specific legal aspect of the Civil War is necessary. 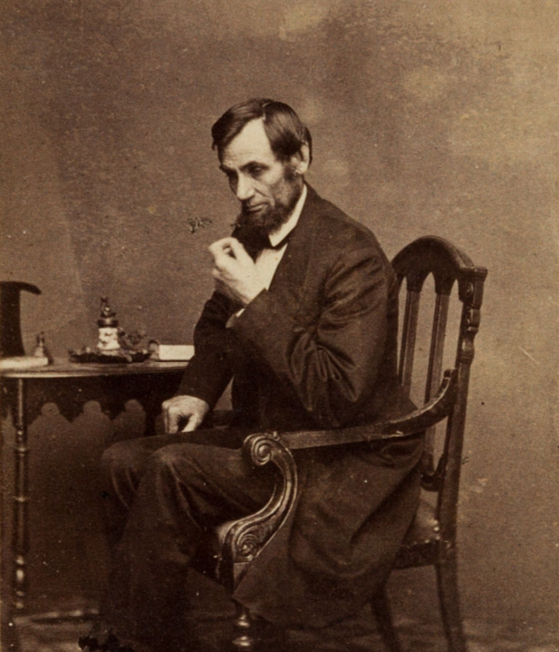 During the Civil War, President Abraham Lincoln suspended the writ of habeas corpus. Habeas corpus, which is Latin for “you may have the body”, is the right for an individual detained by an authority to appear before a court in order to contest the reasons for their continued detainment. In its simplest sense, habeas corpus prevents authorities from locking people away for indefinite periods of time without charge or trial. 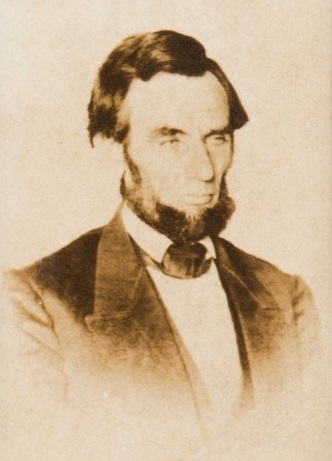 According to the U.S. Constitution the only time habeas corpus can be suspended is “when in Cases of Rebellion or Invasion the public Safety may require it.” So, when Lincoln suspended the writ in 1861, it could be argued that he was in his legal right, due to the open rebellion of the Confederacy. However, the above quote about when one can suspend the writ is detailed in the Constitution under the section describing the powers of Congress, not the executive branch. In short, Lincoln’s proclamation gave military officers the authority to hold without charge or trial those they believed were prisoners of war, spies, deserters, draft dodgers, and aiders or abettors, even if the belief could not be proven. The act of March of 1863, subsequently protected the officers from liability in enacting this authority. 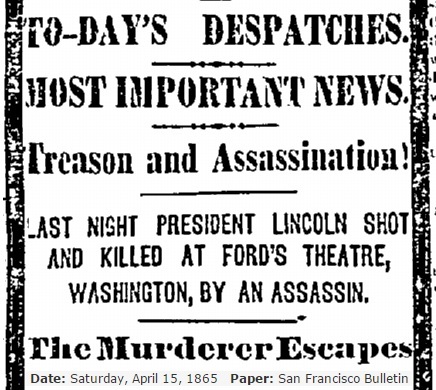 When Lincoln was assassinated on April 14, 1865, the news spread around the country. In some of the western states and territories the reactions to Lincoln’s death were mixed, especially due to the unique blend of Northerners and Southerners who had moved there. It was not uncommon to find ardent Unionists and Confederates living in the same small area. This was the case in an area of northern California called Potter Valley in Mendocino County. The valley was split in its sympathies with those with Southern sympathies settling in the upper part of the valley and those with Union sympathies in the lower part. The original school in Potter Valley had been built in the Southern leaning upper part and, during the Civil War, a second school was built in the Unionist lower part to ensure that the different students in the area received the appropriate political education. When the news of Lincoln’s death arrived in Potter Valley there were those who mourned the fallen leader with intense grief, and those who greeted the news with great joy. One of those joyful men was an older resident of the valley named John McCall. These words would be John McCall’s downfall. Others around the country were learning the danger of speaking positively about Lincoln’s death. The backlash against those who celebrated Lincoln’s death was intense. Mob justice was prevalent with some supporters of Lincoln’s death being swiftly lynched. Even those in isolated towns would band together to punish those gloating rebels. With this order, Gen. McDowell was essentially authorizing the arrest of any person in his district who was demonstrating joy in Lincoln’s death. Whether he knew of this order or not, John McCall made himself susceptible to its consequences with his words on April 20th and April 29th. On June 1, 1865, John McCall saw Union troops riding up to his farm and found himself under arrest. The arresting officer was Captain Charles D. Douglas who was the commander of Fort Wright, located almost 60 miles north of Potter Valley. McCall was not the only seditious citizen arrested that day. Captain Douglas also arrested men by the names of Andrew J. LaFever, Simon Wurtenberg and Thaddeus Dashiell, all of whom had spoken positively of Lincoln’s death with Dashiell having given a celebratory Rebel Yell at the news. Also arrested was the teacher of the Confederate leaning upper school, a Miss Harriet Buster, who allegedly stomped on the American flag after hearing of Lee’s surrender to Grant. Miss Buster was released shortly after her arrest and the men were marched three miles to an adobe hut where they spent the night under confinement. 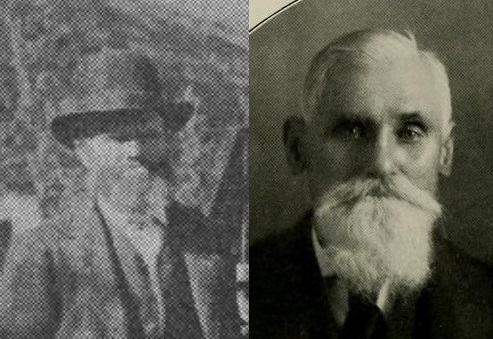 Thaddeus Dashiell and Andrew LaFever, two of John McCall’s fellow prisoners, in their later years. The next day the soldiers and their prisoners made the trek of almost 60 miles north to Fort Wright. There were not enough animals for all of the men to ride and so John McCall and the other prisoners had to walk for most of the way. They passed through the mountains which were high and cold, and had to endure a hail storm as they went. They finally arrived at Fort Wright at between 10 o’clock and 11 o’clock at night. At Fort Wright the men met another prisoner, named James Patrick, in identical circumstances. They slept that night, cold and wet, on the floor of the guard house. The gang stayed at Fort Wright for three days, during which time one of the men, Andrew LaFever took the oath of allegiance and was released. Whether the oath was offered to the others is unknown. From Fort Wright the prisoners were taken by mule to Fort Bragg, a coastal town some 75 miles away. Traveling over mountains meant it took two days to make the trip, but by the evening of June 7th, they arrived in Fort Bragg. McCall would later describe each leg of the journey as being “pulled, dragged and hauled” across the roughest of terrain. McCall, Dashiell, Wurtenberg, and Patrick were marched at gunpoint through the streets of San Francisco to the provost marshal’s office. They were placed in a 10 x 12 ft guardhouse which was “a very filthy place,” Dashiell recalled. The men were handcuffed for the first time and spent two days in the provost marshal’s guardhouse. Captain Douglas, who had escorted the prisoners the entire distance, relinquished his custody of the men to the provost marshal and would make his was back to Fort Wright. The disloyal men from Mendocino County spent six days doing hard labor at Alcatraz. They managed to acquire the services of a lawyer and, despite the suspension of habeas corpus that could have kept them there indefinitely, the lawyer managed to persuade the provost marshal to release them. They were removed from Alcatraz and had to spend one final night at the provost marshal’s guardhouse with drunken soldiers before they were allowed to take the oath of allegiance. Upon taking the oath, John McCall, Thad Dashiell, Simon Wurtenberg, and James Patrick were released and began the long journey back to their homes in Potter Valley about 140 miles away. One would think that the story would end there and that the disloyal secessionists got what they deserved for celebrating at a time of national tragedy. But John McCall was very angry about the treatment he had endured and did not believe that his arrest was justified. 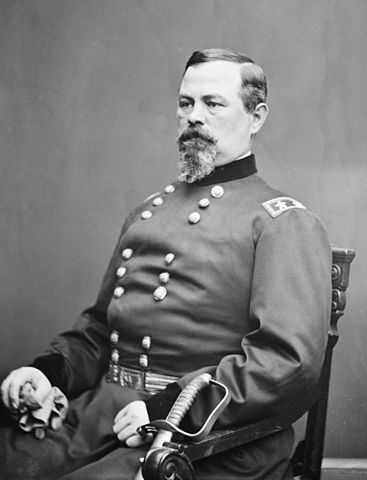 By October of 1865, John McCall announced that he was bringing a suit against Captain Douglas and General McDowell seeking damages of $100,000. Immediately though, John McCall’s case against Gen. McDowell and Cap. Douglas hit a snag. According to Section 5 of the Habeas Corpus Suspension Act passed by Congress in March of 1863, any suit brought against authorities in regards to habeas corpus was to be taken up by the Circuit Court and not by the state courts. McCall, likely hoping to receive a jury trial which would be more sympathetic to his cause, petitioned heavily that his case not be taken to the Circuit Court level where only a judge would decide his case. McCall’s lawyer challenged Congress’ authority to circumvent the lower state courts. On September 17, 1866, McCall’s motion to keep the trial at the state level with a jury was denied. While McCall was waiting to hear about his motion to keep his case at the state level, an act was passed by Congress to further clarify the legal protections granted to authorities during the suspension of habeas corpus. The act, passed on May 11, 1866, granted protection to those who had carried out an order, “written or verbal, general or special, issued by the President or Secretary of War, or by any military officer of the United States holding command of the department, district, or place within which such acts . . . were done or omitted to be done.” This act, meant to help and clarify the defense of military officers, would actually cause trouble for one of the defendants in McCall’s case. In March of 1867, all of the evidence and testimony for the case was taken. Captain Douglas testified about his role in arresting and transporting McCall stating that no deliberate malice was done to the prisoners while he was in charge of them. General McDowell also testified, acknowledging that he gave the order to arrest those celebrating Lincoln’s demise. “I issued this order,” McDowell said, “and I think it quieted the country. And there would have been bloodshed. I think this order saved the lives if not the property of prominent citizens of the city.” Thaddeus Dashiell testified on John McCall’s behalf about the circumstances surrounding their arrest and imprisonment. 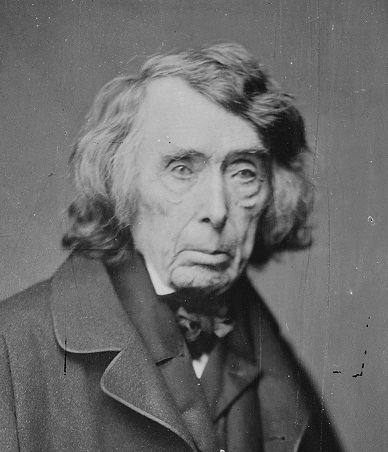 On April 26, 1867, Judge Deady announced his decision on McCall’s case. 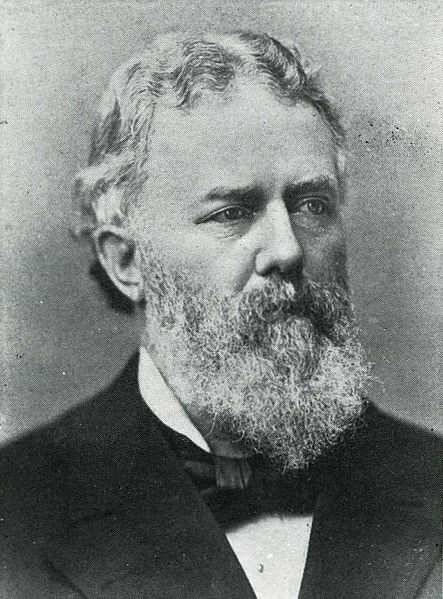 Judge Deady threw out McCall’s case against Captain Douglas due to the March 3, 1863 Congressional Act and act of May 11, 1866 which protected subordinates following the orders of their superiors. It was not proven that Douglas had acted with malice towards his prisoners and thus he was completely free from any liability. The acts from Congress protected Captain Douglas for having “only followed orders”. Surprisingly, however, Deady found that General McDowell was liable for the false imprisonment of John McCall. 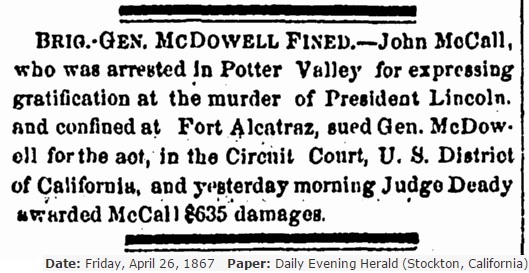 He agreed with McCall’s attorney that the act of May 11, 1866 did not protect McDowell from liability since McDowell was not given any orders by either the President or the Secretary of War to issue the arrest of assassination sympathizers in his district. So while Captain Douglas was protected for following the order, Gen. McDowell was not protected for issuing it. Deady did acknowledge that McDowell was acting for the safety of the public when issuing the order and not out of malice, but contended that he was still subject to legal action due to that order. Deady reassessed the possible damages owed to McCall and decided that he deserved compensation for the money he spent during his time of confinement and an additional $500 for his pain and suffering. In the end, it was the judgement of the court that General Irvin McDowell was to pay $635 to the plaintiff, John McCall. The judgement rocked California. No one had expected John McCall to win his suit against the military authorities who had once imprisoned him. Newspapers reported the names of other former imprisoned rebels who were preparing their own suits against General McDowell and commanders in other districts. Editorial letters denouncing Deady’s decision and poking holes in his logic filled the news. To military leaders out west, the decision of McCall v McDowell was a terrifying one. Though not the $100,000 he wanted, John McCall was no doubt happy about his success against the military might of the abolition party. This last rebel victory, however, would be extremely short lived. For even as Judge Deady was deciding in John McCall’s favor in the west, back east an act had already passed Congress which would overrule it. On March 2, 1867, Congress passed an act establishing the validity and conclusivity of all acts and proclamations of the President regarding martial law and the suspension of habeas corpus from March of 1861 to July of 1866. In addition, the act specifically fills in the gap of protection that Judge Deady observed, by declaring that, “all officers and other persons in the service of the United States, or who acted in aid thereof, acting in the premises shall be held prima facie to have been authorized by the President”. In other words, this act maintained General McDowell’s authority to issue orders as he saw fit and that all such orders had the implied approval of the President. In the end, General McDowell’s attorneys appealed Deady’s ruling based on this newly passed act of Congress, and the decision was overruled. John McCall never received a cent from General McDowell and any planned suits against him by other formerly imprisoned rebels were ended. Unfortunately, John McCall sort of drifted back into obscurity after that. I have been unable to find any record of his later life and death. General Irvin McDowell died in 1885 and is buried at the San Francisco National Cemetery. His subordinate, Captain Charles Douglas, died in 1913 and is buried in Monterey, California. McCall’s neighbor and fellow prisoner, Thaddeus Dashiell, is buried right back in Potter Valley where it all started. Dashiell was elected twice as a county supervisor for Mendocino County and in his later years started to vote Republican. Asked by his friends why he would begin voting for the party of Lincoln, the elder Dashiell would say that he had, “packed sand at Alcatraz for the privilege of expressing any political opinion,” he wanted. Lincoln’s suspension of the writ of habeas corpus continues to be one of the most debated parts of his legacy. Though he had reason for suspending one of the most important personal liberties, it was not an easy decision to make. In addition to stripping away a crucial right of every citizen, suspending habeas corpus also removed one of our national protections against the creation of a despotism. That is why our Constitution only allows for its suspension during times of rebellion and invasion. Even in those cases, however, stripping personal freedoms can be a slippery slope. The not so distant past of the world demonstrates the damage that can occur when those in authority are allowed to imprison individuals without charge or trial. While Captain Douglas may have not have committed a crime when he arrested John McCall, we all know the tragedies of history that can occur in countries where personal liberties are suspended by those “only following orders”.